[112 Pages Report] The IoT monetization market was valued at USD 23.09 billion in 2015 and is expected to reach USD 443.27 billion by 2022, at a CAGR of 52.98% during the forecast period. The base year used for this study is 2015, and the forecast period considered is between 2016 and 2022. Internet of things has been a defining trend since the last decade with trillions of revenue expected from billions of connected devices. These connected devices are expected to generate a huge amount of data to be used by the companies to bring in innovation and automation in their businesses. The increase in revenue with the use of IoT would help all the diverse applications to grow. This aspiring technology is all set to bring in a transformation in the way of living and workstyle of human beings, thereby bringing in a new revolution for interactions between machines and human beings. The use and penetration of the Internet or broadband facilities has increased in the last decade; it is high in the developed countries such as the U.S., Japan, and Germany. According to the census bureau of America’s current population survey (CPS) data documents, the continuous rise in broadband facilities among the people in the U.S. is particularly high for domestic use. The increasing number of Internet users all over the world is expected to strengthen the overall market for IoT monetization. The ever-increasing penetration of smartphones and tablets and the rising demand for connected devices are some of the driving factors for the growth of the IoT monetization market. Smartphones are increasingly becoming a primary device for using email, accessing websites, storing key data, synchronizing work and personal calendars, accessing enterprise applications, and conducting online transactions. The value chain of the IoT monetization market includes cloud platform providers, solution & service providers for IoT, hardware device manufacturers, and software vendors. The major companies that are part of the value chain include PTC, Inc. (U.S.), IBM Corp. (U.S.), Intel Corp. (U.S.), Cisco Systems, Inc. (U.S.), General Electric Co. (U.S.), Oracle Corp. (U.S.), Google Inc. (U.S.), Microsoft Corp. (U.S.), SAP SE (Germany), Infosys Ltd. (India), Tata Consultancy Services (India), Robert Bosch GmbH (Germany), and Amdocs Ltd. (U.S.), among others. In September 2016, SAP SE, Nippon Telegraph, and Telephone Corporation (Japan) partnered to develop an IoT solution for connected transportation safety solutions for collecting and analyzing vehicle-related data with NTT’s hitoe, a jointly developed sensing fabric by Toray Industries, Inc. (Japan) and NTT. In June 2016, PTC unveiled an agile software solution, Agileworx, at the business event called LiveWorx, held in Massachusetts. This solution would help the product engineering teams to innovate their products and would improve time-to-market. In June 2016, Cisco collaborated with IBM Corp. (U.S.) to provide solutions on IoT. With this collaboration, businesses and organizations in remote and autonomous locations would be able to tap the combined power of IBMs Watson IoT and business analytics technologies and Cisco’s edge analytics capabilities. What are the major use-cases in IoT monetization? Which are the major companies using IoT as a tool for monetization? Which countries would lead the IoT monetization market? 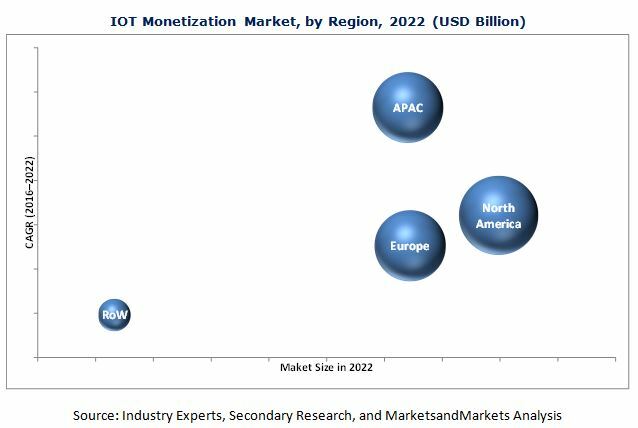 The IoT monetization market was valued at USD 23.09 billion in 2015 and is expected to reach USD 443.27 billion by 2022, at a CAGR of 52.98% during the forecast period. The increasing Internet connectivity, increased use of smartphones and other connected devices, and growing adoption of cloud platforms are the major drivers for the IoT monetization market. The use and penetration of the Internet or broadband facilities has increased over the last decade, the rate of which is high in the developed countries such as the U.S., Japan, and Germany. This factor is expected to propel the growth of the IoT monetization market during the forecast period. The scope of this report covers the IoT monetization market on the basis of application and geography. Automotive & transportation applications are expected to hold the largest share of the overall IoT monetization market during the forecast period. The rising adoption of IoT by automotive manufacturers is driving the growth of the IoT monetization market for automotive & transportation applications. The IoT monetization market for consumer electronics applications is expected to grow at a high rate between 2016 and 2022. The increasing use of consumer electronics in building smart cities, smart buildings, and smart offices is expected to boost the demand for smart consumer electronics. With the emergence of a number of smart appliances that can connect to the Internet and smartphones, the IoT monetization market for consumer electronics applications is expected to grow during the forecast period. North America held the largest share of the IoT monetization market in 2015. The U.S. is a major contributor to the growth of the IoT monetization market in North America. The high growth of the market in North America can be attributed to the fast adoption of new technology by the masses and the presence of several IoT companies in the region, especially in the U.S.; these companies offers a wide range of IoT devices for applications in the retail, industrial, consumer electronics, healthcare, automotive & transportation, and other sectors. 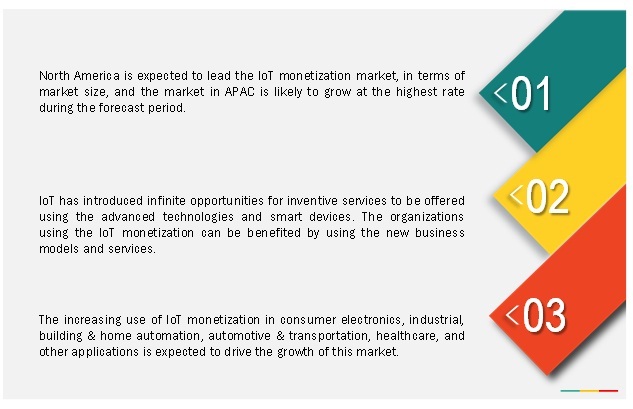 The IoT monetization market in APAC is expected to grow at a high rate between 2016 and 2022. The increasing use of IoT in industrial and automotive & transportation applications in APAC is driving the market in this region. The strong support of government in countries such as China and India to thrive on the digital innovation is also boosting the growth of the IoT monetization market in APAC. In addition, factors such as economies of scale and cross-sector partnerships are fueling the growth of the market in this region. The use of mobile IoT in APAC is also likely to increase in the coming years. The automotive & transportation sector covers connected cars and intelligent transportation systems (ITSs) such as sensors and communication & traffic control technologies. These communication & traffic control technologies assist states, cities, and towns worldwide to meet the increasing demand for surface transportation systems. Vehicle detection and surveillance technologies are an integral part of ITSs as they gather all or a part of the data used in these systems. The systems are being continuously developed to provide enhanced speed monitoring, traffic counting, presence detection, headway measurement, and vehicle classification. IoT plays a key role in industrial applications. The connection of objects through embedded smart devices or through the use of unique detectors and data carriers assist in communicating with an intelligent supporting network infrastructure and information systems; this would optimize production processes and help in monitoring the entire lifecycle of objects-from production to dumping. By tagging items and containers, greater transparency can be obtained about the status of the shop floor, location and disposition of materials, and status of production machines. Nowadays, the manufacturing industry is facing several issues such as fluctuations in regulations across different regions, rising employer costs, and frequent breakdown of machines. The retail sector deals with a large number of people, and IoT in the retail sector caters to the demands and needs of these customers. Retailers are focusing on gaining maximum advantage through IoT solutions and discovering various functional areas in which IoT could draw major revenue benefits, along with providing innovative solutions to their customers. The use of IoT in these functional areas would help retailers improve their business efficiency and draw better customer retention. The concept of IoT in retail has revolutionized the way retailers interact with their customers. Factors such as lack of common communication standards across platforms and lack of power-efficient devices are restraining the growth of the IoT monetization market. This report discusses the drivers, restraints, opportunities, and challenges pertaining to the IoT monetization market. In addition, it analyzes the current market scenario and forecasts the market size till 2022.